To display settings, menu contents and controls for Level editing in a Warped region, the procedures are almost identical to those for Pitch editing. Press S on the computer keyboard to switch quickly between Pitch and Level editing. Pitch and Level are not displayed simultaneously. As shown below, when in Level editing mode a dB grid is superimposed to show the level of blocks in dB relative to full scale. 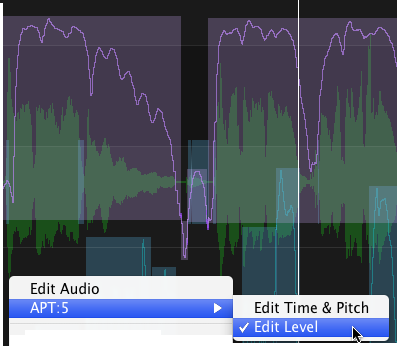 Level blocks correspond to note pitch boundaries and can be grabbed and moved up or down, while the pitch or sibilant is heard. The average level of the block is displayed. 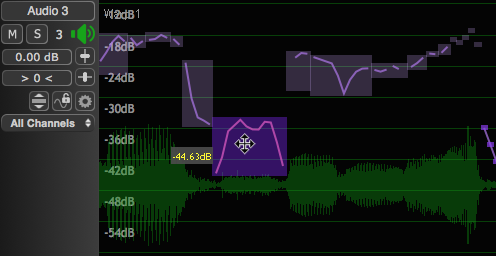 If alt is held down while dragging, Level changes are constrained to 3 dB steps. Also, groups of Level values can be copied and pasted from one block to another. Level measurements and Blocks of Level measurements can also be manually edited in APT processes. In the APT Control Panel, in the Display & Edit section at the bottom, Level must be selected ON. 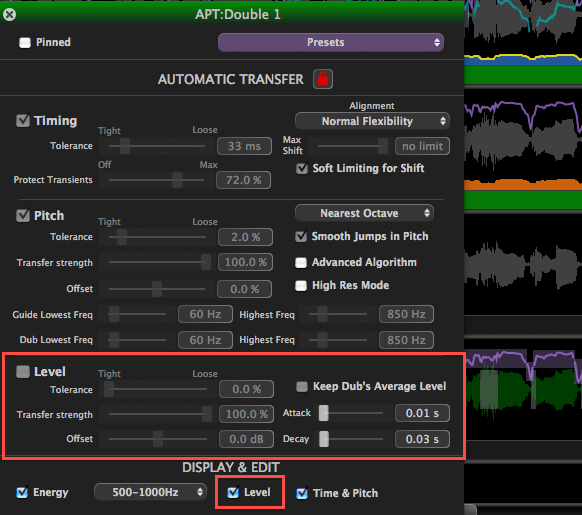 In the Automatic Transfer section, Level can also be selected if you want level measurements to be transferred from the Guide to the Dub's output automatically. You don't need to do this and it is off in the APT function for this example. But it still can be edited manually. RIGHT CLICK in the APT Output track to bring up the menu shown below, and use the mouse to LEFT CLICK the option Edit Level. Once this is done, the Level Measurements will be initially automatically put in groups in Blocks, and the contours displayed as shown by the upper Level Trace in the image below. These Blocks can be edited in much the same way as Pitch blocks, mainly by manipulating the upper and lower edges of the Blocks.